Pellet Heat has become one of the area’s most popular alternative to conventional heating fuels. We pride ourselves in being in the forefront in offering our customers environmentally friendly PELLET FUEL for many years. Our Pellet Family has grown to over 1500 customers in our area and we take enormous pride in assisting them in the challenge of heating their families in a safe, affordable and clean fashion. 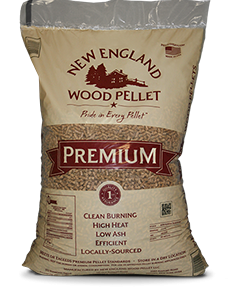 NEW ENGLAND PREMIUM PELLETS are our brand….We have been carrying the New England Pellets as our main pellet for years….